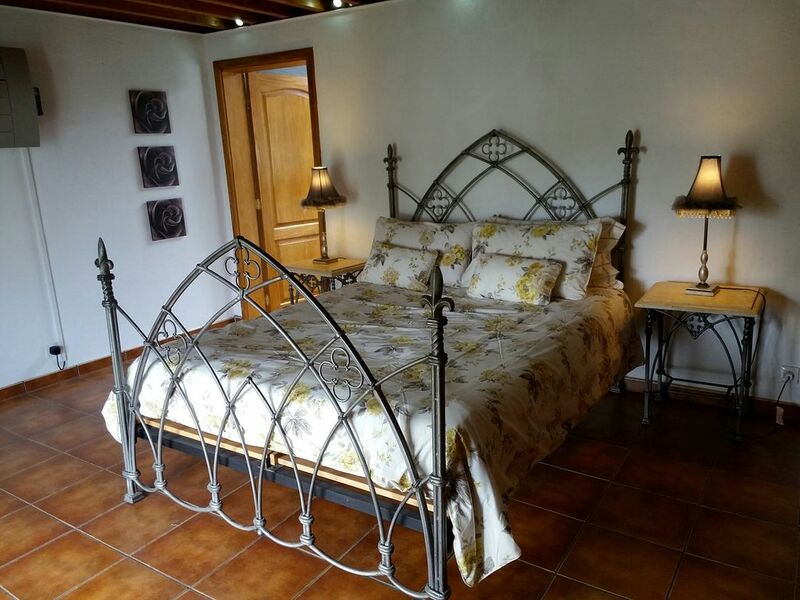 Situated on a 1,000m2 plot in probably the most central and sought after area of delightful Playa Blanca and only 5 minutes walk from the village and beach, this beautiful, traditional villa is furnished to the highest standard and offers all the comforts of home. The villa is detached, has a large drive with parking and private garden all around. There is a private, heated pool with spacious terrace and sunbeds. In addition, residents and guests of Los Calamares have the advantage of the free use of the community tennis court. The flat screen TV with TV streaming for BBC and ITV channels, plus NetFlix , DVD with a selection of movies plus the Nintendo Wii games console are just the beginning! The hifi system with bluetooth has speakers both in the house and the terrace and the free WiFI even works by the pool! Playa Blanca: Nestled at the most Southern point of the Island, Playa Blanca (White Beach), once a small fishing village has grown sympathetically into a relaxing and tranquil resort. Family friendly, you can enjoy dinner whilst your children play on the beach in front knowing they are safe and in sight. There is a vast choice of restaurants including some excellent fish ones and a good selection of shops selling everything from flip-flops to diamond jewellery. Out and About: Although a car is not necessary for this villa, we generally recommend one. Benefits include avoiding taxi queues at the airport and not having to carry the shopping! A small car may be hired for as little as GBP18.00 per day and when you realise a taxi from the airport costs about €45 it all makes sense! There is of course the added benefit of being able to use a car for day trips perhaps to Fire Mountain or El Golfo. I fell in love with Lanzarote and in particular Playa Blanca back in 1980 and was an annual visitor until I bought the Squid House in 1998. At the time there were very few houses in Playa Blanca and I had a choice of about 7 !. Over the years the house has evolved and been practically rebuilt . Originally a small two bedroom cottage it is now a spacious 4 bedroom , 3 bathroom house with pool. I still adore Playa Blanca and travel there at every opportunity which means at least 4 times a year. I hope you will love Playa Blanca and the Squid House as much as I do. Fully equipped with everything you need to prepare and cook for 8. French doors open from the large, comfortable sitting room on to an expansive covered terrace offering additional, shaded, dining and lounge area. There is a small bar with a fridge on the terrace to keep those cold beers close to hand! Spacious open terraces surround the pool and built-in barbecue with ample sun beds for everyone. The gated pool area makes the villa particularly attractive for parents with young children. There is a play area for under 5s with little tikes play cube and a box of toys for younger children. A selection of CD’s, dvds, books and games are provided for your enjoyment. There is also a DVD player and Wii console. Mini-golf on site Free WiFi All guests are provided with hand towel, bath sheet and beach towel. Two hairdryers. Such a lovely house - great location, fabulous outdoor garden/pool and the bathrooms are superb! We had a fantastic Holiday at The Squid House! It is in a fantastic location, which was only a 10 minute walk into the centre of town for our 2-year old. There is so much space around the Villa that if you do need a time out (for whatever reason) you can take yourself off for some quiet time. Although the pool isn't as big as most others in the area, it had more than enough space for us (4 x Adults & 1 x Toddler, plus inflatables). For a family, it really does have it all as well... Large Cot, Travel Cot, Highchair, Bed Guard, small Buggy, etc. It was an added benefit to also be provided with Tea, Hand, Bath and Pool Towels! Finally, Therese was fantastic to deal with from start to finish! From the first contact with Therese I was very impressed. The Villa description was accurate and all the information clear .The Villa is lovely and airy with great outdoor relaxing spaces near the pool and eating and lounging furniture . Inside the bedrooms are clean and everything you need is provided . Music , Tv , DVD, games and a drinks cabinet . Utility room for laundry and well equipped kitchen .One of our party has stayed at Squid House several times and recommended it for our group. I can certainly agree it is a great place to stay . Villa in great central location, walking distance from village centre, bars and restaurants. Villa was very clean, well equipped and maintained. It has been extended with good sized en-suite to master garden bedroom. Loved the outdoor space which has been improved since our last stay. Would stay here again! Our family party consisting of three generations have just returned from an excellent holiday experience having stayed at Squid House, Playa Blanca. A lovely villa, having a very spacious, well planned layout which is generously equipped. Having a heated swimming pool and excellent outside covered terrace for relaxing or alfresco dining was particularly enjoyable for all concerned. Our grandchildren also got plenty of use playing in the spacious garden area with children's play house and slide. Comfortable modern ensuite bedrooms with extra's such as slippers, robes and toiletries, even 'mini squid' robes for the little ones further enhance the relaxed vibe one experiences staying in Squid House. The villa is also very well located being within close proximity of supermarkets, shops, restaurants and two beautiful child friendly beaches.Very good communication with the owner Therese who provided us with reliable recommendations including our airport transfer needs-First Minute Transfers. Wonderful holiday experience had by all, so not surprisingly have already provisionally booked for next year. Playa Blanca centres around the village and harbour. Los Calamares is the closest private villa community to the village and beach. Local area map available by email or fax.